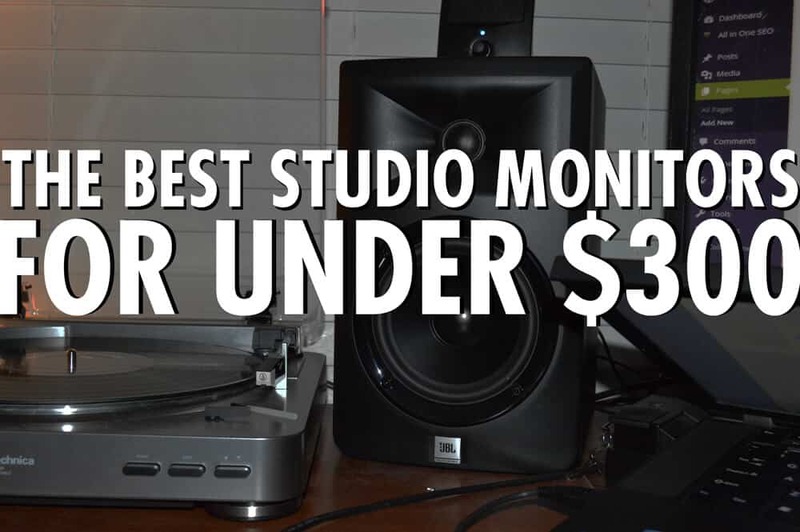 HomeThe best studio monitorsThe best studio monitors for under $300 | NO DOUBT! Finding out the best studio monitors for under $300 can be frustrating. Luckily for you, I have the solution!! Before I tell you what it is, grab a snack, sit back and relax because..
For me, the process of finding monitors that were of a superb quality, but also didn’t cost a fortune was tough. It took a lot of digging, back and forth, and verification from multiple websites before I decided that the 305’s were legit. What are studio monitors? To make a long story short, I did a lot of digging before I purchased the 305’s. I can tell you without a doubt that they are the best entry level monitors, the best under $300, and will serve you well for a long time. As mentioned above, I’ve had mine since 2014 and they are still going strong. They are built like tanks, and the volume for a 5″ woofer is completely insane to me. The first time I cranked these babies up I was blown away. Of course I had to throw on some Rage against the machine, and boy let me tell you you won’t be sorry! Lol. I only had the dial on 6 or 7 and they completely blew me right out of my room. Haha. If you’re new to studio monitors watch out. Build wise like I said they are phenomenal, feel heavy and rugged, and don’t take up too much space on your desk. Some say they are ugly but I would disagree with that. Sound wise? Very neutral, and perfect for mixing. I use them to mix down hip-hop (when I have time), and they really have improved my mixes tremendously. For these, you don’t necessarily need to invest in a bunch of foam, but it does help regardless. Acoustic Sound Treatment. Because they are fit for smaller rooms they don’t absolutely require treatment. Some bass traps and a few panels do go a long way however, and if you plan to upgrade in the future you may as well invest. You may be wondering about the bass response. It’s tight and deep, but never feels bloated or cheap like your standard KRK line (sorry I had to). I am really appalled at that overall sound when I compare it to these. It’s night and day really, and there’s no contest. Check out the sound test (includes a comparison of the Yamaha HS5). Because the HS5’s are around $400 for the pair, I didn’t include them. But they are also a great entry level option as well, albeit more neutral, and flat across the board. Would you like to learn more about the 305’s? CLICK HERE TO READ MY OFFICIAL JBL LSR 305 REVIEW!! Well that’s about it for today folks! I hope you enjoy the review and have come away with something in this best studio monitors for under $300 article. Questions? Comments? Requests? Did I miss the mark? Let me know in the comments or Contact me!! I look forward to speaking with you..
Great set of monitors. I am just looking at various options to buy for personal use. Is it the best in its class or are there any other jbl monitors out there which are reasonably priced and serve the purpose? The review is provides lot of information… what purpose do you use these monitors especially for? Hey glad you stopped by! I do believe these monitors are the best in class. If you find a bad review let me know, because I have yet to find one, lol. And I have been researching them on and off for a couple of years now. I use mine for mixing, but they are also phenomenal for just listening as well. They are extremely pleasant to just chillax with.